In this episode of New Soundwave: The latest news Street Fither X Tekken: Woot! Starcraft II Brian eats knockoff Teddy Grahams on camera — hey, we have this episode on video! Join us on Facebook to participate in the discussion and get exclusive updates. In this episode of New Soundwave: The latest in the console wars Namco/Capcom vs Capcom/Namco?! What was the best portable console? Join us on Facebook to participate in the discussion and get exclusive updates. In this episode of New Soundwave: XBox 360 Slim Arcade Details Blizzard Backs Down on Real IDs EVO Championship What Happened to Sega? Join us on Facebook to participate in the discussion and get exclusive updates. 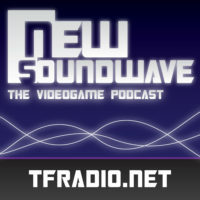 In this episode of New Soundwave: Real ID comes to the World of Warcraft Metal Gear Solid: Peace Walker NBA Jam Way more! Join us on Facebook to participate in the discussion and get exclusive updates. In this episode of New Soundwave: Green Hornet Trailer Johan Hex Tanks More Avengers Cast More Apes Cast More More! Join us on Facebook to participate in the discussion and get exclusive updates.